We woke up and hit the trail by about 7:15am. Most of the trail we covered today was pretty standard, winding through national forest areas, over small streams and creeks, and near interesting stuff. In this case we walked past the Brown Mountain Creek Community area (where some former slaves lived post-Civil war) and the Lynchburg reservoir. We got to US 60 around 11:30, where we got a shuttle to Buena Vista (after some minor shuttle shenanigans). We are staying at the Blue Dog Art Cafe, which has a small hostel in an upstairs apartment. It’s decent for a hostel. The most exciting things that happened in town today were getting my new sneakers and eating a crapton of town food. 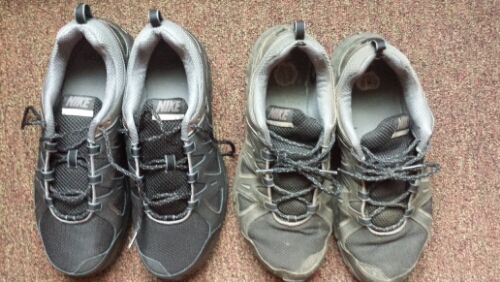 Guess which pair has gone through 802 miles of the AT? To their credit, Nike Alvord 10 trail runners are super durable. Destroyed. Easily. After a huge lasagna dinner. This is a short stay, as we are back on the trail tomorrow as we are pushing hard to hit the next town, Waynesboro, by Wednesday. The next couple days look pretty challenging and the weather is supposed to be stinking hot down here, so I predict I will burn off those 1200 delicious calories of dessert pretty fast. This entry was posted in food, gear, updates on June 8, 2014 by Joel. Congrats on another milestone! I am in awe of what you’ve accomplished!!! (Although I’m not a bit surprised about the amount of ice cream you ate…not a bit. 🙂 ) Glad your new shoes arrived safe and sound and your well-worn sneakers can now go into retirement. Be safe and healthy…particularly in the hot weather. Sending ice cream thoughts, prayers and lots of love! It/s so comforting for us to know that you get to to enjoy some creature comforts and indulgences on your trek. You two deserve every one of them, irregardless of the calories!! I am so impressed with the amount of connectivity you’ve had along the way. You should send the sneaker pictures to Nike…they might reward you with a lifetime supply of footwear! You are spending incredible days which you can never erase from your memory. Happy travels!! KATTTIIEEEEEEEE, you have crossed over into page three of six of the magical map. Miss you! 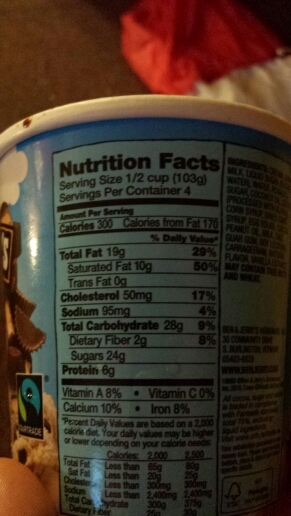 170 calories from fat. Beautiful!